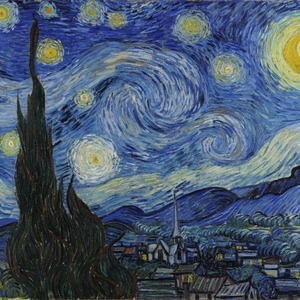 Now you can enjoy Starry Night on a daily basis! Well not all of it! To put this rectangular painting (roughly 4x3) on products, we use as much of the painting as we can on each product. So for a square product like the shower curtain - we use a 3x3 rectangle - which cuts off a little of the sides - but is still very much The Starry Night! For other products such as the wristlet (a wide 4x1 rectangle) - you get a small slice of the painting. We have many other famous paintings / works of art in our system - painting such as Van Gogh's Sunflowers, Botticelli Primavera, Monet's Bridge Over A Pond of Water Lilies, Rousseau's Seine and Eiffel to name just a few. Browse our system to see the full collection. If you are looking for something and do not find it, please contact us and we will do our best to meet your needs.